Jambalaya with layers of flavor. Luscious oyster and artichoke soup, shrimp remoulade, perfectly spiced jambalaya and Creole rice custard pudding. That was celebrity chef Kevin Belton's menu at the PBS North Coast's benefit dinner in October at the Carson Mansion's Ingomar Club in Eureka. Not to worry if you missed the decadent affair. 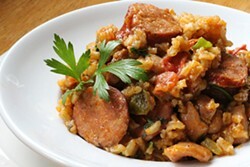 Belton has graciously shared the recipe for his coveted jambalaya so you too can taste a bit of New Orleans. 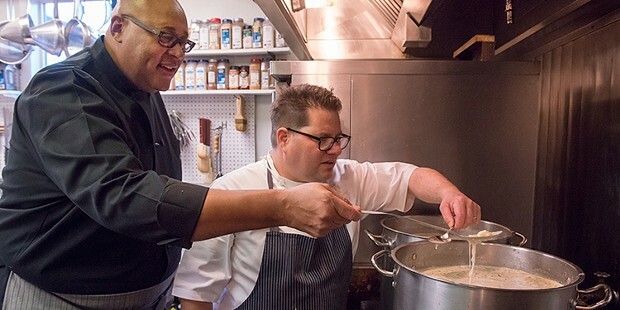 For those unfamiliar with Belton, you can tune in to PBS on Tuesday afternoons at 4 p.m. for Cooking with Kevin Belton, where you'll find him teaching the masses about Louisiana classics like gumbo, étouffée and eggs Sardou. "I watched Julia Child on PBS, Justin Wilson and Paul Prudhomme," Belton said at the event. "I never thought I'd be doing what I do today. Now I'm on PBS and I've come full circle." Belton, who hails from uptown New Orleans, is a self-taught chef. He describes his roots like "gumbo," having English, French, Native American and African ties. He learned many of the classic Creole and Cajun dishes from his mother and grandmother. He got his start as a young child, at 6 or 7, helping in the kitchen with little tasks like snapping beans, pulling shrimp and cutting lemons in half. Since then, he's taken it up several notches. 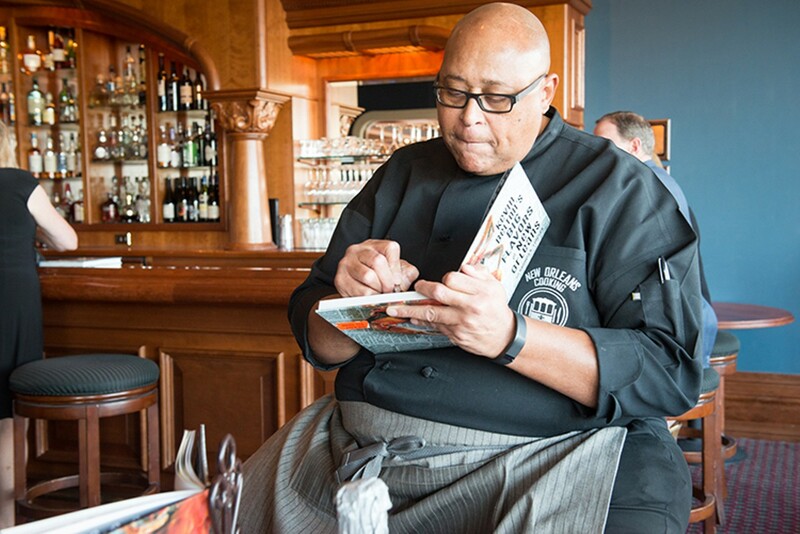 For the last 20 years, Belton has been teaching others how to cook Louisiana cuisine with his signature flare. He's got a big presence — he's 6 foot 9 inches — and has charisma audiences adore. 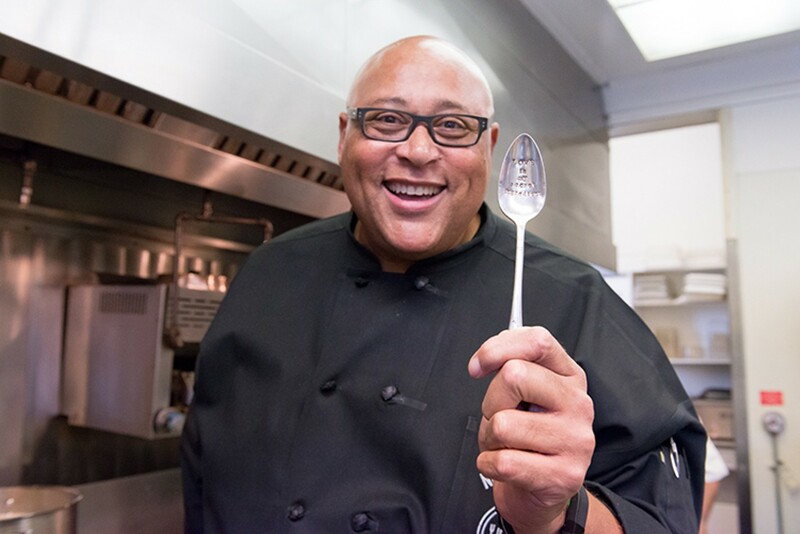 Belton has a long-time affiliation with New Orleans' public television station WYES-TV, and he has been a featured chef on food programs in the U.S. and abroad. 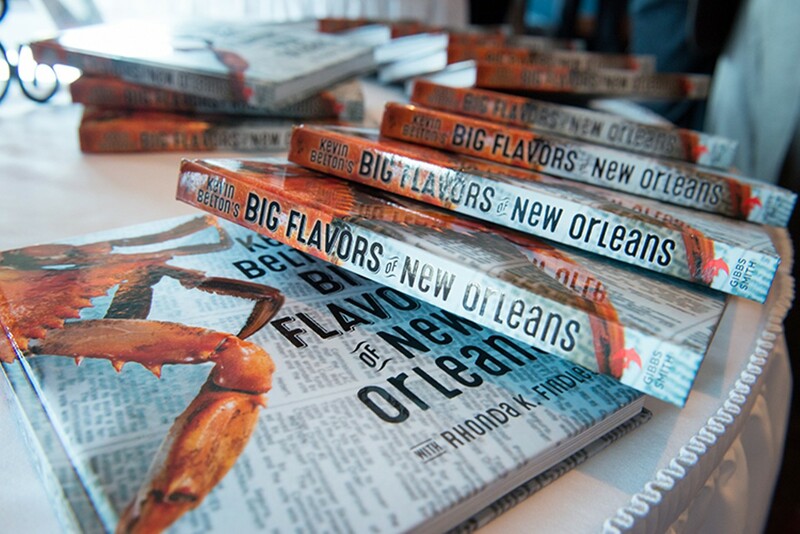 In the Big Easy, he is also a well-known instructor at the New Orleans School of Cooking. 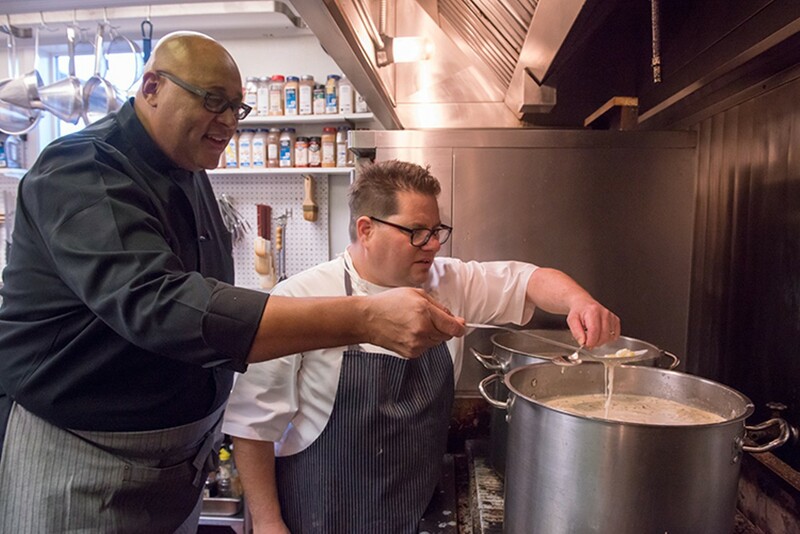 There he gets plenty of requests for lessons on how to cook the one-pot meat and rice favorite jambalaya — the pièce de résistance at the PBS dinner prepared by Belton and Ingomar chef Dan McHugh and his staff. Belton's red jambalaya is layer upon layer of flavor: a tad sweet from tomatoes and paprika simmered slowly with garlic, peppers and Creole spices; smoky sausage; and a slightly piquant bite that tingles the tongue but not overly so. With each incredible bite, you'll be reminded why New Orleans' food is frequently lauded as some of the best in the world. Bon appétit! Belton's recipe, from his book Kevin Belton's Big Flavors of New Orleans, is reprinted here by permission of Gibbs Smith. It's relatively straightforward but I included some information in brackets to aid in shopping and preparation where unclear. In a large heavy-bottom pot, sauté the onions, celery and bell pepper in butter over medium heat until the onions are translucent, about 8 minutes. Add garlic and continue to cook for 1 minute or until you can smell the garlic cooking. Add the chicken and sausage and sauté for 2 minutes. Add the tomatoes and Creole seasoning and sauté for 2 more minutes. [Add 2 teaspoons salt if using a salt-free Creole seasoning.] Add broth and rice. Stir and bring to a boil. Reduce heat, cover tightly and simmer until rice is cooked, about 20 to 25 minutes. Adjust seasoning with salt and pepper. Stir in parsley and scallions and serve immediately.